Visually, the 1G and 2G iPods look the same. Only the scrollwheel and a cover for the FireWire port on the 2G distinguish the two models from each other. 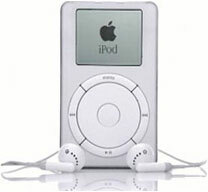 Looking at price, the 2G iPod provides twice the storage capacity of the original at the same price. It uses a 10 GB or 20 GB 1.8″ Microdrive, has FireWire to connect to a Mac or Windows PC, and includes a headphone jack. There is no USB connectivity. Four buttons surrounded the scroll wheel: menu on the top, play/pause on the bottom, previous track on the left, and next track on the right. The button at the center of the scroll wheel is the select button. Announced: 2002.07.17 at US$399 (10 GB) and $499 (20 GB). Replaced by 3G iPod in April 2003. Included accessories: earbuds, AC adapter, FireWire cable, iTunes 3 CD. PC version included 4-pin to 6-pin FireWire cable and Musicmatch Jukebox software. Display: 2″ 160 x 128 pixel LED-backlit LCD. Charge time: 3 hours max. iTunes Versions: iTunes 3.0 and later. Mac OS Required: Mac OS 9.2.2 or later, OS X 10.2 or later. A History of the iPod: 2000 to 2004, Tom Hormby, Low End Mac.